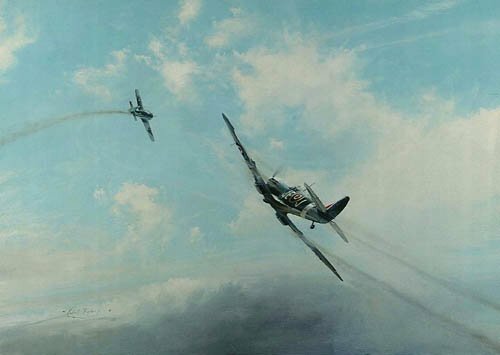 During operation Ramrod 792 on April 25, 1944, leading his Spitfire wing, Johnnie Johnson had a long-running combat with an FW190. Robert Taylor shows the last moments of the duel which ended in victory for the Allied Air Forces leading fighter Ace. Each print is individually signed by the artist and Johnnie Johnson. The Multi-Signature Edition is signed by an additional FOUR Allied Fighter Pilots.